Vaishnavi Pallapothu is an avid reader, writer and unabashed tv-show binge watcher. Although science will always be her passion, she is deeply interested in teaching and social activism. She is also very fond of traveling and learning new languages. 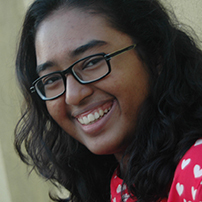 Currently pursuing an undergraduate degree in International Relations, Vaishnavi hopes to imbibe as much knowledge as she can about politics, intersectional feminism and development studies. She is a co-author on the blog In Your Face* (outspokenspeakers.blogspot.in) and writes articles about topics that question her worldview. Vaishnavi is also a regular contributor to the Red Elephant Foundation’s medium page. She provided inputs on a book authored by Gayle Kimball (professor at university of Chicago) about Women in India. She recently attended and represented the Red Elephant Foundation at the World Urban Forum’s Youth and Children Assembly held in Kuala Lumpur, Malaysia.